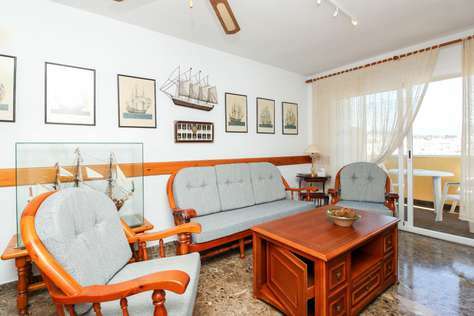 This comfortable holiday apartment with a unique old fashioned decor is situated in a few steps away from Estepona Beach. With a maximum capacity of 5 guests, it has 3 bedrooms, 2 bathrooms, a spacious living room with balcony, parking, wifi and etc. Situated on the fourth floor accessed by elevator this holiday apartment for rent makes part of a secure urbanization offering a free private parking lot. The building is found in front of the beach having restaurants, bars, shops and etc. in a walking distance. A spacious living room is divided into two areas: a seating area with sofas, TV set and stereo system, and a dining area. It opens into a balcony with outside furniture where you can enjoy your breakfast overlooking the town, a bit of mountains and the sea. Fully equipped kitchen has everything you need to prepare your meals, including a stove, an oven, a microwave, a big fridge, a coffee maker, a toaster and small laundry room. Master bedroom has king size bed and ensuite bathroom with shower. The second bedroom offers 2 single beds. Both have big built-in wardrobes. The last one offers a folding bed for one person, working desk and a huge bookshelf. Baby cot and highchair are available for an additional fee. Estepona village is found in less than 10 minutes’ drive from famous Puerto Banus with its luxurious shops and nightlife.